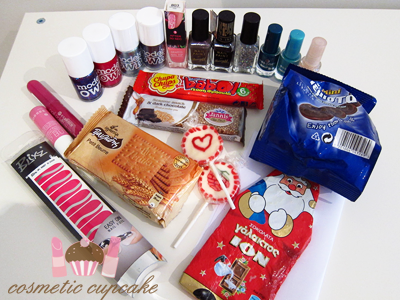 I have for you today an awesome Christmas package I received from my dear friend Christina from Cels deco nails. This is our 3rd swap already (how time flies when you have so much fun!) and she continues to spoil me absolutely rotten x) Her package also happened to arrive on Christmas Eve which was so fast! Luckily I took this photo as soon as I opened the package because the chocolate Santa was gone in about 5mins lol. It was delicious!! I also love those types of lollipops so I had to hide them before I devoured them straight away haha. Isadora Graffiti Nails Crack polish in pink, Barry M Instant Nail Effects in black, Dusky Mauve and Hologram. These polishes are so awesome and speak for themselves =D The nail effects didn't survive transit unfortunately as the cap came loose and it dried out =( Does anyone know a way of rescuing it? Dusky Mauve looks so pretty and I can now see why people made such a huge fuss about Paradoxal. 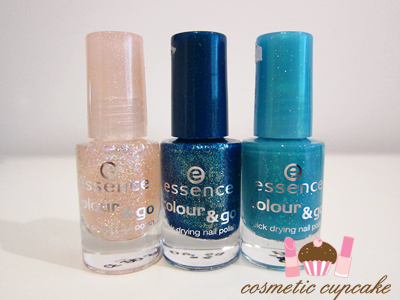 Essence Color & Go Space Queen, Choose Me! and Glisten Up!. I've just changed my nail polish to Choose Me! and it's GORGEOUS! Thanks for crossing it off my wishlist Christina! Blixz nail strips, Essence nail polish remover pen and Korres Mandarin lip butter stick. You know me so well Christina! I LOVE remover pens and lip products (plus it's Korres to boot yay!). Some delicious Greek treats! Thank you to Christina's hubby for choosing the snacks hehe. I am sending big virtual hugs your way Christina in thanks for yet another fabulous package! I have so many awesome goodies to try now =D I actually haven't tried some of the polishes and items from our last swaps so I have to get a move on! I hope your package arrives soon too. Have you done any swaps lately? 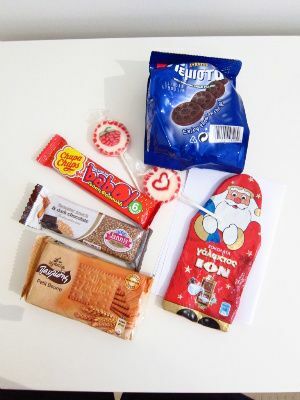 What goodies have you received? brill swap you got some great stuff!! great swap! that pink crack polish looks awesome. Im always up for a swap but I havent done any recently! I am so happy you liked everything my dear :D And still surprised over how fast it arrived! @나니 : It was definitely an awesome package! @Steph xox: Ohhh that's disappointing =( thanks anyway Steph! @Steph: Cheers Steph! I'm so fortunate that every swap is always so wonderful. @Breanna: I definitely enjoyed the package immensely! So many wonderful goodies to try hehe. @Aysh: Same here! I don't know how I survived without my pen before lol. Hmmm I did read about that but I'm scared of putting remover into it.. I might have to try it though. @Christina: I loved everything, thank you so much =D I was so surprised too! Usually all my parcels arrive last hehe.